I live in white linen trousers during the summer. These have a very wide, straight leg. Shown with a butcher’s stripe shirt. My shoes are brown and white spectator penny loafers by Martin Dingman. 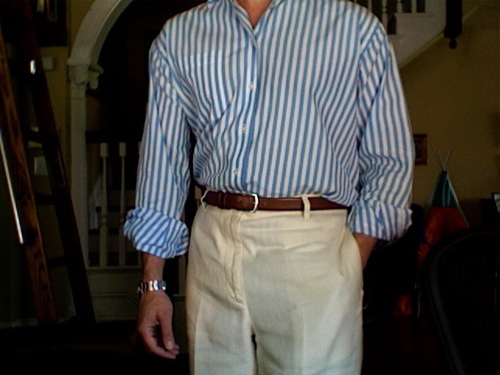 This entry was posted in Elegantology and tagged Friday casual, summer clothing. Bookmark the permalink. perfection. I was just about to ask about the footwear, but I see you handled that well as all. It’s the very casual rolled up sleeves paired with the crisp pants and bold watch that strike a nice balance for me. Just the right amount of hardware on the belt. Perfection.